Architecture has always influenced how we use and enjoy our homes, but 21st century homeowners expect more from their properties than ever before. Queensberry Properties’ sales and marketing director, Hazel Davies explains. “Residential property design has always been shaped by two distinct (and sometimes opposing) forces. Builders and developers are responsible for setting the architectural agenda, introducing new features and demonstrating what can be achieved with the latest materials and ideas. However, we’re also duty-bound to acknowledge changing consumer tastes and adapt property styles in response to evolving buyer preferences. “Throughout the last century, architectural trends came and went. In the 1930s, bay windows and sculleries were all the rage. Post-war austerity led to affordable building materials like concrete being widely used. Brutalist architecture fell out of favour in the 1970s as the conservation movement gathered momentum, while the 1990s saw executive homes built in vast greenbelt estates. This century has already witnessed a renaissance in townhouse living and huge demand for urban high-rise apartments, among other evolving trends. “Like most prime site property developers, Queensberry Properties sets and follows the architectural agenda in equal measure. For example, we recognise the vogue for full-height glazing in modern apartment buildings. 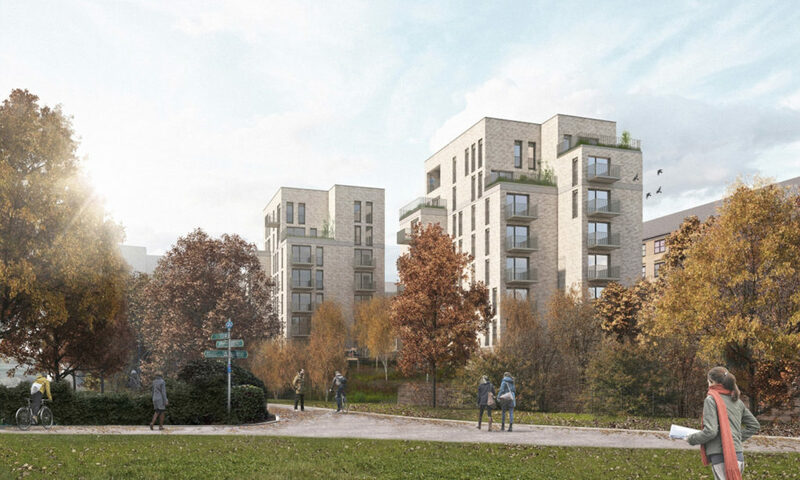 We’ve drawn up plans for four stunning residential apartment buildings by the banks of Glasgow’s River Kelvin, where open-plan living spaces culminate with glazed access to projecting balconies and terraces. This celebrates Otago Lane’s riverside location, while maximising ambient light levels throughout living spaces which meet the expectations of discerning apartment buyers. “We also have a responsibility to set the architectural tone in developments like our new Waverley Square residential project within the New Waverley complex off Edinburgh’s Royal Mile. A strong appreciation of function, materials and surroundings was needed to design a mixture of flats, mews houses and maisonettes in such an iconic location. Key challenges involve integrating 59 underground parking places and dovetailing our designs with the neighbouring retail, commercial and leisure units. Our plans for Waverley Square wouldn’t seem as effective in any other location. “Location can also affect a development’s planning approval. Specific building materials might be required to blend in with the surroundings – granite in Aberdeen, or red sandstone in Ayrshire. Other sites require solutions to geographic challenges, such as basement levels for bungalows whose plots slope away from the road. Developments in the catchment area for sought-after schools tend to feature villas and townhouses, whereas city centre developments often suit the minimalist lifestyles of studio apartments. “Studio homes may be compact, but they usually boast high levels of technology – which also affects architectural design. Consumer preferences for recessed spotlights and skirting-level LEDs require complex wiring schematics and kitchens are becoming hotbeds of technology from wine fridges to plate warming drawers. Architects also have to consider environmental factors, from sourcing sustainable construction materials through to reducing energy bills. The latter can be minimised with large south-facing windows, and maximising insulation wherever possible. “Successful architecture should deliver cohesive homes that place few compromises on their owners. Effective design and construction creates desirable and flexible living spaces which will last the test of time, catering for today’s homeowners but also hopefully suiting future generations of residents as well”.